I can’t think of a better way of presenting your own compositions, especially ones as gorgeous as these, than with an ensemble that embraces them with such a deeply passionate performance. To say that they get under the skin of these long-limbed and poised masterpieces, performing with a lovely flexible sense of timing would be an understatement. Guitar, piano, saxophones, bass and drums float exquisitely limpid lines in the graceful, contrapuntal musical movements of each chart, allowing them effortlessly to unfold. The always sensitive Peter Hum brings his velvety sound and unobtrusive virtuosity to the music, allowing it to breathe as well as leaving open plenty of space for the other musicians to have their say. There are many examples of this throughout the record, but I would strongly recommend Roma Rising in which the leader fosters a wonderful three-way conversation with the two saxophonists. Both Kenji Omae and Nathan Cepelinski are warmly spontaneous, unleashing ardent melodies without a fuss. On other tracks too (La tendresse s.v.p., for instance) the musicians simply pick up from where they left off. The rest of the rhythm section is not far behind at all times and play with a beautiful forward drive bringing a huge range of colour overall. Together, all of the musicians’ traversal of Peter Hum’s music shares a supple rhythmic flexibility. Alpha Moment’s opening is big-boned and generous, with a sense of depth and spaciousness that gives the piece an almost orchestral scale. The Saddest Day of the Year is no less luscious. The other repertoire is no less exciting with the musicians’ penchant for diving headlong into the development of each with absolute abandon. 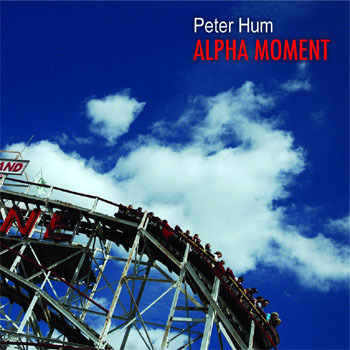 Peter Hum deserves attention and praise not simply for his compositional skills. His pianism is the reason why the music is powerfully and lovingly delivered. His fingers are almost spirit sensitive and this enables him to make the keys sing in a most ethereal manner. Thus his music glistens and gleams with great power and abject delicacy as well. His expression, dynamic and pedalling, especially in the slower movements, provides an amplified radiance to the songs. This also provides much inspiration to the rest of the ensemble. And they do not disappoint either. This is a luminous recording and Hum should be very proud of it indeed. Track List: The Good Fight; Roma Rising; La tendresse s.v.p; Voice From Afar; Alpha Moment; Bon Vivant; Carlingwood; Saddest Day of the Year. Personnel: Peter Hum: piano, electric piano; Kenji Omae: tenor saxophone; Nathan Cepelinski: alto and soprano saxophones; Mike Rud: guitar; Alec Walkington: bass; Ted Warren: drums. TMR Senior Writer. Based in Milton, Ontario, Canada. Raul is a musician and an accomplished writer whose profound analysis is reinforced by his deep understanding of music, technically as well as historically. Toronto Music Report is a project dedicated to the promotion and advancement of the Canadian Music scene and its creators. We support Arts and Culture in Canada without reservations.